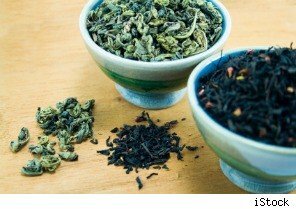 All About Food: Which Is Better: Black Tea or Green Tea? You've probably come across the comparison between black tea and coffee. But have you ever heard about black tea being compared to green tea? They're just about the same, right, since they're both tea kinds? Well, both tea variations may come from the same plant and leaves that chinese people use to make tea (camellia sinensis), but each one still has their distinct differences. Two of the most popularly drank teas are black tea and green tea. But both still vary when it comes to the color each one expels when soaked in water, the way each one smells, and the way each one tastes. Tea variations such as these two can also differ in their final composition, as the geography can also have an effect on each type. But when it comes to the health benefits that can be acquired from drinking tea, studies show that green tea offers a more wide-ranging effect compared to black tea. Although drinking black tea also has its health benefits, it's not quite as effective when compared to what green tea can provide. How is this so? Well, green tea has what you call 'catechins' (the one element that's responsible for its many health benefits). This is the tea's main ingredient and it has about 8 times more when compared to what black tea has. Now, if the catechins that black tea has aren't oxidized too much during the processing of it (it turns into theaflavins and thearubigens), then it could possibly have greater benefit. Aside from having to differ in color and taste, each one is also at variance, especially when it comes to how they are made (how each one is processed). While green tea leaves go through a lighter oxidation process (a minimal process so it is able to retain its polyphenols), black tea is done the other way around. It goes through more processing, which also leads to destroying essential compounds such as polyphenols. So if you were to choose which one to drink, keep in mind a few points: green tea has more antioxidants and has less caffeine in it. Apart from that, it also helps not stain your teeth when you drink it regularly. Although both aid in specific benefits when it comes to health, both tea kinds are still beneficial for daily intake. But still, you decide which one to favor.